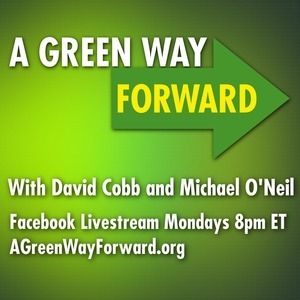 We found 10 episodes of A Green Way Forward with the tag “green party”. David and Michael are joined by Hillary Kane and Erin Fox from the Green Party's Coordinated Campaign Committee to talk about how Green candidates and campaigns can get help. David and Michael discuss Democrat's toxic and entirely unsurprising crackdown on the left wing of their membership. Our live interview with Tim Canova, Independent Candidate for Congress in South Florida. You know him from challenging the odious Debbie Wasserman Schultz in the 2016 Democratic Party primary, in which a judge just ruled that ballots were illegally destroyed before they could be investigated for (ahem) irregularities. David Cobb and I are excited to talk to Tim about breaking free from the Democrats, the current campaign and the latest fallout from the ballot destruction ruling. David Cobb and Michael O'Neil talk to Young Greens Organizer and Green Party of the United States Co-Chair Chris Blankenhorn on the role of the Greens' national youth caucus and the growing role of Eco-Socialism in the Green Party. A Green Way Forward for 2018-02-19: FLORIDA! RUSSIA! What can we do??? A Green Way Forward for 2018-02-12 - What Is the DNC Good For?